BEIJING—Thousands of Tibetans gathered to mourn a farmer who died after setting himself on fire to protest Chinese rule in Tibetan areas, claims a US broadcaster. A London-based rights group said the funeral on Saturday turned into a protest march, with thousands calling for freedom and the return to Tibet of the Dalai Lama, their exiled spiritual leader. The incident, as with most reported unrest in Tibetan areas, could not be independently verified. Nearly 30 Tibetans have set themselves on fire over the past year to protest the suppression of their religion and culture and to call for the return the Dalai Lama, who fled the Himalayan region in 1959 during a failed uprising against Chinese rule and is reviled by Beijing. The Communist government has accused supporters of the Dalai Lama of encouraging the self-immolations. US broadcaster Radio Free Asia (RFA) said in a statement that Sonam Thargyal, a 44-year-old farmer, fastened cotton padding to his body and doused himself with kerosene before setting himself on fire on Saturday in Tongren, a monastery town in western China's Qinghai province. He also drank kerosene, the broadcaster said. “The Tibetans who were at the scene attempted to put out the flames, but death was very fast because of the kerosene inside and outside the body,” RFA quoted Dorjee Wangchuk, a Tibetan exile in Dharamsala, India, with close ties to the Tongren community, as saying. Thargyal called out for an end to Chinese rule in Tibetan-populated areas, the return of the Dalai Lama and Tibetan language rights, RFA said. 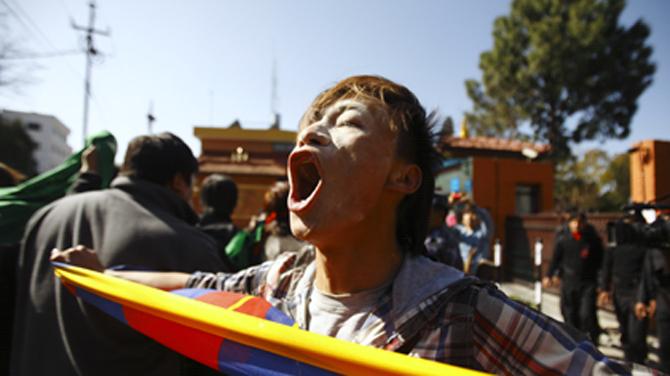 As many as 7,000 Tibetans took part in Thargyal's funeral and cremation ceremony, the broadcaster said. The London-based rights group Free Tibet posted photos on its website of what it said was Thargyal's charred body covered in ceremonial yellow silk scarves and of hundreds of people marching up a hill to the local cremation site. Free Tibet said Thargyal, the father of three, had been close friends with a monk who survived a self-immolation attempt on Wednesday, also in Tongren. The monk, Jamyang Palden, is believed to be alive but critically injured, it said. Telephone calls to the Tongren county government and police rang unanswered Sunday. A man who answered the telephone at the government office of Huangnan prefecture, which oversees Tongren, said he had not heard reports of an immolation or a protest. “All things here are fine,” said the man, who, like many Chinese bureaucrats, refused to give his name. A man who answered the phone at Tongren's Yunlong Hotel, which is close to the funeral site, said he was unaware of any self-immolation or demonstration. Free Tibet said there was a small confrontation between the mourners and Chinese security forces, but that it was mediated peacefully and the security forces withdrew. “It is believed that the paramilitary forces had to withdraw given the vast numbers of Tibetans present,” Free Tibet said. The Dalai Lama has praised the courage of those who engage in self-immolation and has attributed the protests to what he calls China's “cultural genocide” in Tibet.